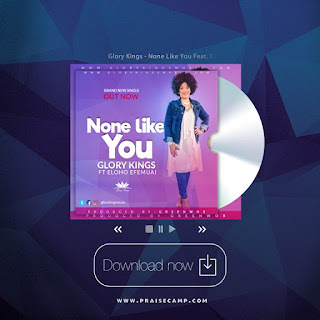 Singer, songwriter and worship leader - Glory Kings team up with international Gospel music minister, worship pastor, Heartsong Live vision bearer and Engage Nights convener - Eloho Efemuai to assert and proclaim that there is none like our God in 'None Like You. Glory Kings (Real Name: Glory Oturu) is a UK based Nigerian worship leader and songwriter. Born in Owerri and from Umukabia, Amaigbo Imo State, Nigeria. An ardent music lover, she started singing at a very young age back in Celebration Chapel Choir, Sokoto State Nigeria. She had several encounters with God who called her into Gospel music ministry. Glory is a Nurse by profession, but her passion for music saw her planting a fellowship [now a Church] in Federal NeuroPsychiatric Hospital, Sokoto where she worked as a Mental Health Nurse. She was the Music Director and also a member of a band who ministered at events and organized concerts. A standout ministration was one in Birnin Kebbi Polytechnic where they had a powerful concert and inspired many through music and prayer. She later joined Living Faith Church Choir [Winners Chapel] Sokoto, shortly after returning back to school for her Midwifery course. Her vision is for God to use her music to touch and transform many lives across the globe. To see men, women, boys and girls of all race, continent, background, worship, get inspired, healed, delivered, receive miracles and salvation through her music. Above all, for the name of Jesus alone to be lifted, magnified and glorified through worship and praise. Glory is happily married to Dr Kingsley Oturu and are blessed with a son.